Before starting, I studied the ending of the movie when Rey finds Luke Skywalker on the mountainous island. Her hip holster is dark brown with an open bottom and a strap that secures it to her thigh. It appears to be a simple design made of leather. I also used the Rey action figure for reference, which shows the folds on the front part of the holster. Next I drew a sketch of how I thought the holster was made showing 1 – the separating flap which ends up on top, 2- the right side flap in the middle and 3 – the left side flap which is folded over first. I then used this sketch to make a template from file folders. Poster board or construction paper is also good for making templates, since they are thicker than regular paper. I decided to make the holster from a single piece of leather folded onto itself, so both the outside and visable inside sections of the holster are smooth leather. These 3 pages combine to make the template. After perfecting the template, by test fitting it around my blaster, I marked and cut the pattern out of my leather using a utility knife. For my blaster I needed a piece of leather about 11″ x 22″. To make sure everything fit correctly, I cut the side flaps and the bottom separating flap about 1/4 of an inch larger than my template. I used a 4/5 ounce weight leather hide and I think any heavier would make the holster too thick. To align the (upper) inside section with the (lower) outside section of the holster I first cut the lower section, then folded the leather down and used the lower section as a guide to cut out the upper section, making both pieces perfectly matched. To construct the holster the 2 halves need to be glued together. I used Dap Contact Cement, available at Home Depot. Since the fold of the 2 sections creates an opening for the belt, that area does not get glued. On the rear of the holster I cut 2 slots about 1 inch long and 1 inch apart for the thigh strap to pass through. The area around these slots is also left without glue, so the strap can pass through. After gluing these areas, I fit the blaster into the holster, marked the final sizes and trimmed the flaps so they ended up exactly the right size. Looking at the holster from the front, the left flap is folded over first, then the right flap and finally the bottom separating flap. The blaster is only held in place by the friction of the tight leather, so after marking the locations to glue the 2 side flaps, I added another 1/16 of an inch for extra tightness and glued them together. Next the bottom separating flap needed to be glued in place. I again marked the proper size with the blaster in the holster to make sure everything fit. Since I had initially cut it larger, there was extra leather material to allow it to be trimmed to the perfect size before being glued in place. To make the thigh strap, I cut a strip of leather 3/4 of an inch wide. For proper fitment and to allow the hardware to be attached, it needs to be approximately 8 inches longer than the wearer’s mid thigh measurement. I dyed the leather using 2 applications of Eco Flo Gel Antique Dark Brown Leather Dye. After the dye dried I sealed it using some water based satin polyurethane I had from another project. Eco Flo also offers a variety leather finishes to apply after the dye, available at Tandy Leather. The hardware for the thigh strap is only shown briefly in The Force Awakens, when Rey is walking up a hill toward Luke. One end of the strap is attached to a rectangular ring with two rivets and the other end uses what appears to be a stud to fasten it through the ring. First I looped one end through the ring and attached it with two rivets using the rivet setting tool, which is just used to smash the two sides of the rivet together. I also added two rivets to the upper section of the holster, below the belt loop opening at the point where glue ends. Next, I sized the strap to the proper length by looping the other end of the strap through the ring and marking the proper spot for the stud. It is best to leave a couple extra inches, to allow for future adjustment if needed. The stud simply installs by screwing the two parts together through a small hole in the leather. Finally I marked the hole location for the stud to go through and used a punch to make the hole. If size adjustments are needed later, the stud can be moved or additional holes can be added to the strap. This is the holster strapped to the hip and worn from the lower section of Rey’s unique belt. This picture was taken before the rivets were added below the belt loop. Click here for detailed instructions on constructing Rey’s blaster and check back soon for more Rey costume pieces including Rey’s belt from Star Wars The Force Awakens! Hello! Your Rey accessories are amazing! I am new to cosplay and wanted to do Rey’s Resistance costume for Comic-Con this summer. Can I ask where you purchased the leather? I’m still trying to get all my resources in order. 🙂 Thanks! Thank you. The leather is from Tandy Leather. 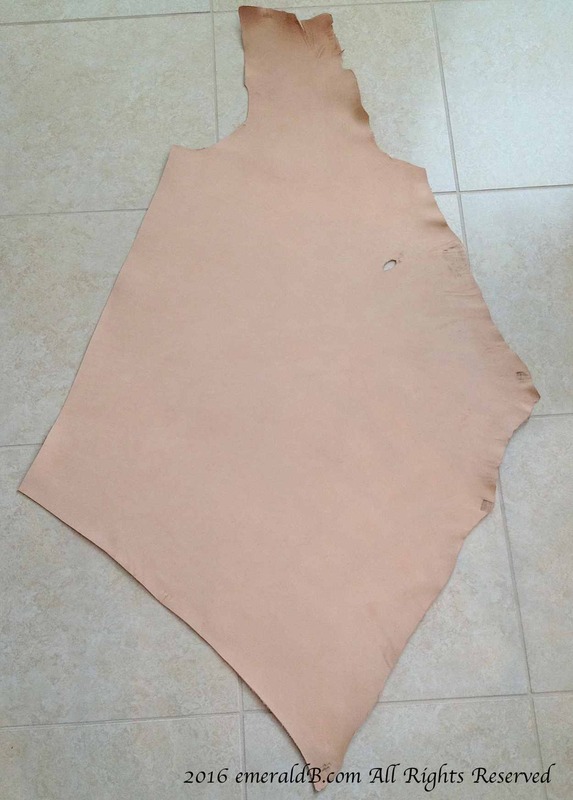 I purchased a 4-5 oz 1/2 shoulder of veg tanned leather for $30. It was enough to make the holster, belt, and bracer with some left over. Hello! Im putting this cosplay together myself, but I have been having trouble finding suitable pants, do you have any suggestions? I’ve just started looking for the pants but haven’t found anything yet. My plan was to buy full length pants and then shorten them, using the excess length to make the knee pads. You might want to check out the Jedi Rey Costume Standard on the Rebel Legion Forum: Jedi Rey Costume Standard. I’m not sure that I agree with their determination that the pants are brown. They appear to be more of a dark olive/brown to me. I plan to do a post with instructions for the wrist cuff, but the belt will be next. If you buy a half shoulder of leather you should be able to make the holster, belt and wrist cuff out of it. Would you be willing to make s holster to order? If so would be interested in the price! Unfortunately I’m not able to do any commissions at this time.